The Koombana was a single screw passenger liner built in Scotland in 1908 for the Adelaide Steamship Company in Port Adelaide, Australia, she was 340' long and 48' wide and registered at 3,668 tons. Koombana was used as a coastal steamer between Adelaide and Broome and probably other ports. On March 20, 1912 Thomas M. Allen, her master, and the master of the SS Bullara, another ship of the same line, discussed whether they should sail or not due to the weather conditions, but both decided to proceed. Bullara sailed thirty minuets before Koombana, it was about 11 a.m. Capt. Allen seems to have sailed against his better judgment as he was heard to say "I'm going straight out to sea, and I will be lucky if I get to Broome by Saturday." 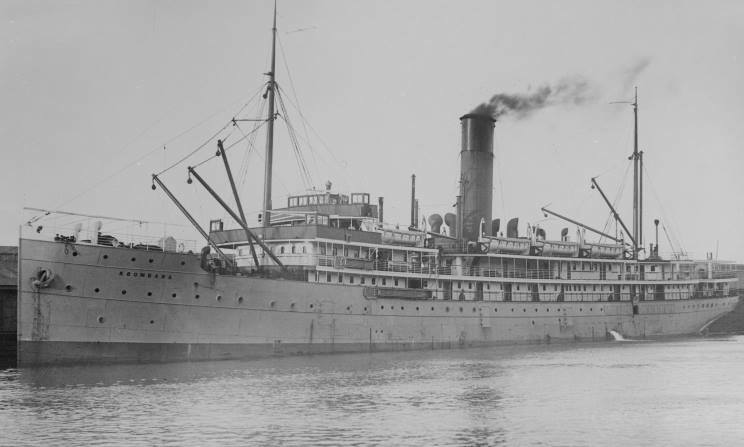 On March 21st the steamer Montora, bound for Singapore, made contact by wireless with the Koombana, but her master stated that the signals were not clear, however he also stated that he knew they were in trouble. It is not clear to me at the time of writing this why the master of the Montora did not make more of an effort to investigate the type of distress the Koombana was in. Both were of course by now in the fiercest storm to hit the Western Australian coast in living memory. The storm, now known by some as the Koombana cyclone, lasted for three days and caused tremendous damage to several towns and caused the loss of a number of ships, including the Koombana. The wireless signal sent on Mar. 21st was the last time the ship was heard from. A few days after the storm searches were made by several ships, but nothing was found until early April when wreckage began to show up. A door identified as the door off the chief stewards cabin was found and various other wreckage was found, but no bodies were ever recovered. In all one hundred and thirty-eight people were lost with the Koombana. To this day the wreck has not been located. The loss of the Koombana came just days after the loss of the Oceana (Mar. 16) in which seventeen people were lost, it was big news, but it was soon overshadowed by the next great sea disaster, that occurred on the night of April 14-15, 1912, the loss of the Titanic blocked out almost everything else in the news, including the Koombana story. SS Koombana, date and location unknown.